Pêchez dans les eaux au large d'Isla Holbox au cours de cette excursion privée de 4 heures. Avec un capitaine local à bord, vous bénéficierez de toutes les informations sur les meilleurs lieux de pêche en choisissant d'être autant ou aussi peu orienté que vous le souhaitez. Lancez une ligne pour pêcher des poissons tels que le mérou, la Blonde, le Chac Chi, la Mojarra et le loup de mer avec seulement 3 autres passagers, ce qui vous garantira une attention personnalisée et exclusive. De retour sur la terre ferme, apportez vos prises dans un restaurant local et apprenez la meilleure façon de le préparer tout en grignotant un ceviche frais. L'utilisation de tout l'équipement de pêche est incluse. The fishing trip was great for the most part. 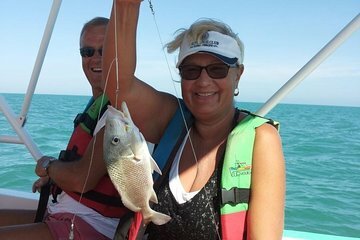 There were two couples and the captain and we caught LOTS of fish. The 13-gallon pail was so full, the last few fish caught kept jumping out of the pail onto the floor of the boat. Afterward the captain took us to a secluded beach to explore while he made fresh ceviche. The only problem we had is the captain did not offer us any fish to take with us. It was ackward to ask when we were leaving because the fish were nowhere in sight. He had transported to a different cooler. When I went back an hour or so later to ask about it, we were told ironically by the owner of the business who also owns a seafood restaurant that we should have asked. The right things to do would have been to offer us a free fish dinner or some such thing, but it did not happen. It was a good trip but it taught me a good lesson. The next island we visited I made sure to ask before we got on the boat, are we allowed to take the fish we catch? We were with Captain Eddie and his brother Willie, and a family of 5. The description says with only 3 other passengers, ensuring that you receive personalized attention and don't feel crowded So we did feel crowded, and I think some of us missed fish because of the cramped quarters. Now for the positive, both Eddie and Willie are extremely knowledgeable and affable.They did a great job, the cerviche they made was outstanding.It was a beautiful, warm, sunny, clear day. Overall, other than the crowded conditions, we had a fantastic time, and caught a lot of fish. I would highly recommend this tour. It was a highlight of our 5 day stay. Rojo was our guide - very helpful, informative and fun. We line caught red mouth, yellow tail, then he and the boat captain fixed the best ceviche I've ever had. We had a wonderful time!